You would never envision, tucked away on the topmost level of a high express, to locate a supreme bar and eatery with an alfresco, and a housetop patio serving great food at sensible prices. These amazing and classy rooftop bars in Dubai are one of the best kept secrets. There is no other city that could surpass Dubai for its amazing rooftop bars and lounges. The sheer number of rooftop venues in Dubai makes the place special, particularly for party and fun lovers. However to be successful and popular, a rooftop venue needs to offer delectable food, excellent drink and snack selection and most of all, a breathtaking panorama that mesmerizes you. 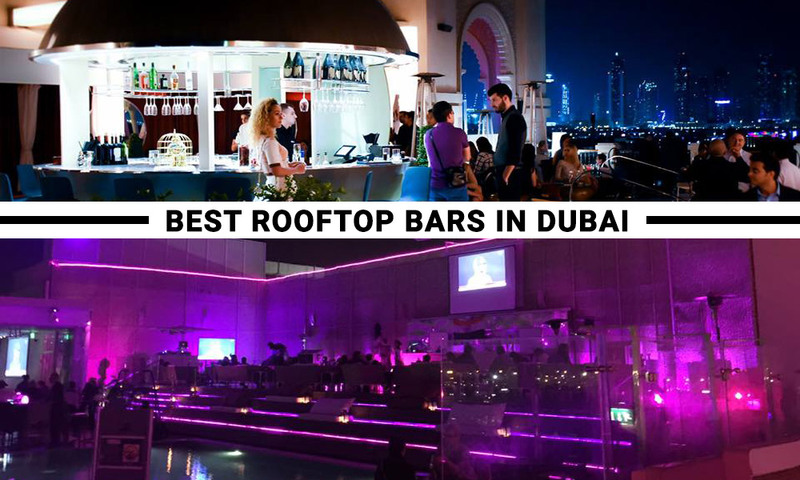 So, ranging from sundowners to late night partying, here listed are the top 5 rooftop bars of Dubai that you are likely to find in Dubai. Completely boasted with unobstructed views of Dubai’s skyline and city lights, this place is a real gem to the city’s nightlife. Serving as an excellent selection of alcoholic drinks and cocktails, alongside a full-fledged menu for international cuisines and brunch, it is absolutely perfect for late-night partying and tranquil sundowners. Ad-on features of Estrellas Skyline include exclusive private dining, Shisha, free Wi-Fi, prior reservations for guests, vegetarian menu, valet parking, smoking area, live music, VIP arena and much more. Average costs for one ranges between AED 50 to 200. On weekdays the bar remains open till 1:00 am however of weekend they serve till 3:00 am. The Estrellas Skyline Lounge is located at Meliá Dubai – Bur Dubai. You may dial +971 (4) 3868111 for reservations and details. The jewel on the crest of Four Seasons; the Mercury Lounge is a dynamic Dubai rooftop bar with fresh zephyrs and exceptional panoramas, superintending the skyline and horizon of Dubai and the greatest Burj Khalifa on one side, and the bright green Arabian Gulf on the other. The place offers you a groundbreaking range of cocktails, Shisha and Medusa alongside their trend-setting melodies that buzz around the floor. Live DJ keeps the energy rising and high until dawn. Exclusive Arabic style of seating called ‘Majlis’ in alcoves is perfect for exclusivity and private dining. The place is super classy and expensive too. So plan it for a special occasion. It also has limited seating so dial +971 4 270 7777 for prior reservations. The Mercury Lounge is placed inside Four Seasons Resort, Jumeirah Beach Road Dubai. Situated over the 35th level of Al-Bahar Tower –Jumeirah Beach Residence; the Pure Sky Lounge is a rooftop bar in Dubai of optimal choice for those who are fond of catching spectacular sights of Dubai sunsets over the ocean. Their extensive range of cocktails, alfresco barbeque, live music and amazing food menu won’t allow you rundown. The specialty of the place is its ‘Sunset Brunch’; and their entrees entertain you the most while enjoying the sunset. The Pure Sky Lounge is perfect to enjoy a perfect evening out with friends and your loved ones. It is placed over Level 35 of Hilton Dubai – The Walk, Dubai Marina. Located over the 24th floor of Jumeirah Beach Hotel, Uptown Bar is a high-end and classy cocktail bar on the rooftop which offers a picture-perfect spectacles of the Arabian Gulf and Burj Al Arab. Something special about the place is its amazing theme nights that keeps on going for a week and special Friday post-brunch offers. When it comes to Uptown Bar, it’s hard to beat for unperturbed sundowners with a stunning view of the emerald ocean. The place is amazing for capturing mesmerizing outlook of the ocean on one side and sparkling city lights on the other at the same time. Uptown Bar is located at Jumeirah Beach Road, 24th Floor – Jumeirah Beach Hotel – Um Suqeim – Dubai. Dial +971 (4) 406 8762 for details. Not what you would normally consider while bearing in mind of a rooftop bars in Dubai, this submission from the One & Only Royal Mirage is a tranquil Arabian-enlivened venue that tranquilities and compose your senses. If you don’t like it inside, drag yourself on the terrace to enjoy the genuine inducement which will soothe your nerve with unhampered outlooks out to the ocean. The place offers an exclusive range of alcoholic and non-alcoholic beverages, a wide array of international cuisines, live music, private dining and much more. It is located at Dubai Marina. Dial +971 4 399 9999 for reservations. These are some of the best and known outdoor rooftop bars in Dubai & visiting one of the bar is a must-do night activity in Dubai. If you have experienced one of the above mentioned venue or like to recommend one, please do so by adding comments below.